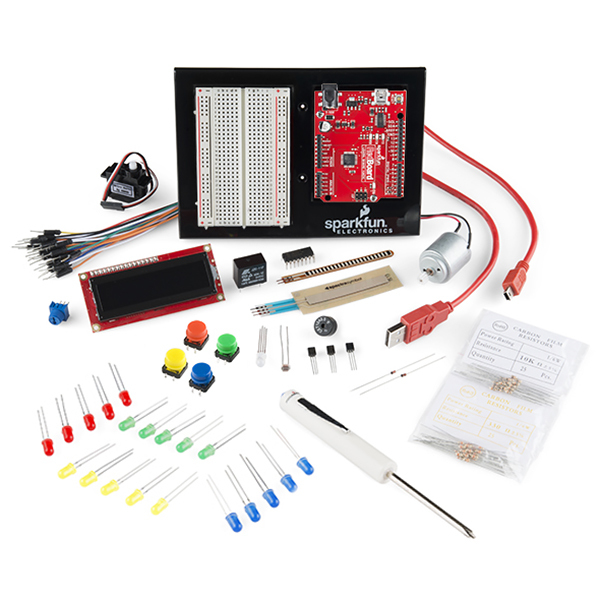 Over the past few months, most of the discussions I've had regarding getting people into electronics have shifted to what's next after going through the beginners' kits like the SparkFun Inventor's Kit. I'll explain some of the ideas that have come to mind, and I want to see what you guys think as well. One of the main goals here at SparkFun is putting electronics within reach for most, if not all people. It's what we strive for with our tutorials, educational outreach and starter kits. Electronics can be a scary endeavor that poses so many "snag points" that could immediately turn someone off of learning more. Starter kits like the SIK do a good job of keeping learning electronics and coding through Arduino rewarding, with small but meaningful payoffs or achievements with each project in the guide. Over many iterations of this guide, it's definitely become a front runner for learning electronics. But what happens once you've completed these starter kits? This is where it gets confusing, because there are so many routes you can take. Think of it like a choose-your-own-adventure book, but the list of possible actions goes on for pages. Maybe you want to learn more about wireless, maybe it's power supply design, maybe you want to figure out how to build your own Arduino. The point I'm getting at is what's next isn't always clear, and most times it's full of rabbit holes to go down. In addition, it's often unclear how far into each topic you need to go. One of the areas I often hear people want to learn more about is what each individual component does and what role it plays in a system (think things along the lines of current limiting resistors). With something like that, it's possible to go really in depth. Do you stop at what the component does, or do you figure out how it does it? Do you dive into learning things that Physics 2 personally taught me? Is that necessary for someone working at this level? So if someone came to me today and said they had gone through the Inventor's Kit and were looking for the next step, I would say, "Figure out what you don't know that you don't know." A phrase I often borrow from our CEO Nate, I feel it accurately describes the situation people find themselves in when taking unconventional routes of learning a skill. With organized learning methods, you have someone (knowledgeable) constantly guiding your attention. When you're learning on your own, that element is lacking, so there's this additional step of figuring out what to learn next. This becomes difficult when you are unaware of some of the topics you need to learn. With the expansive and open nature of Arduino, it's easy to find the information you need to learn the skills that will make you a better embedded developer/designer, or help you complete the project you've set out to do. But figuring out which information is needed and pertinent is difficult. There isn't much organization with all this information. So what can be done? If I had to choose an approach, I would start with learning electronics 101 outside of Arduino. Learn the more basic elements of electronics – even more basic then programming microcontrollers. I see two ways to go about this: Read books on it or take a class. We're lucky at this point to have access to one of the best written books on the topic of electronics that's been updated to reflect current trends in electronics. 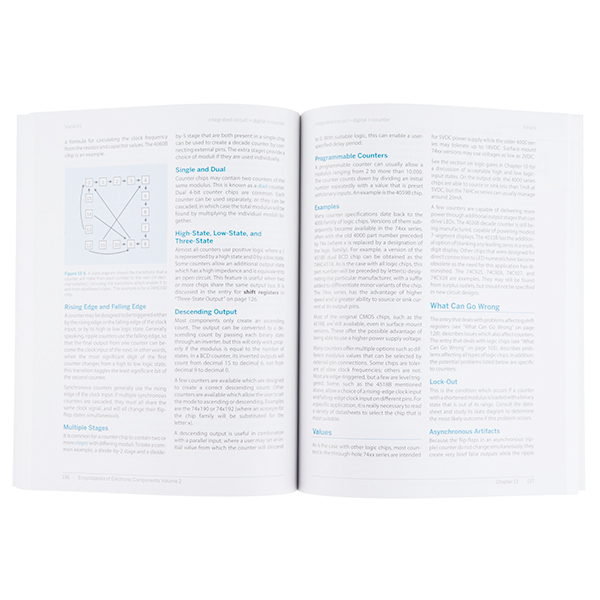 The Art of Electronics is seen by many as the book on electronics. We were unable to find a way to stock this book (logistical issues) but highly recommend it. Even if you don't feel you can read the entire book, look at the topics covered; it should help you when learning what you don't know that you don't know. There are plenty of other books on the topic as well, so do your research at the bookstore. The other route is take a course on the topic, something like Electronics 101. Again, we're in a privileged time where online courses have good substance and are readily available for free. This bridges the gap for people who want to learn on their own in an organized or structured learning environment. This solves the big issue I mentioned earlier of figuring out what you need to learn. Using either of these routes, you expand your general knowledge of electronics and create a base knowledge which you can expand upon in specific areas as you go. So what about SparkFun? We have positioned ourself as a place to go to learn these topics and find documentation and information accessible to all. It seems fitting that we would be able to take this on. Ideally, the goal is to find a way for people to learn electronics in a practical manner, that stops short of an associates degree but gives you a good understanding of what needs to be known. Well, we are trying to accomplish this. We think about this question a lot more than you would think. With our education department, we aim to get electronics into a feasible curriculum for all ages. By doing so, learning electronics on your own becomes a lot less of an issue. We constantly are brainstorming where to go next with the Inventor's Kit. Do we cover more topics? Do we introduce new topics? Do we go more in depth with the existing topics? How do we bring those using the Inventor's Kit to the next level? A while back we taught a class on soldering at a local hardware store. Taking classes like this are a great way to make learning electronics a lot less intimidating. These are good starts, but they do not address the issue head-on: the underlying issue of essentially tying all the information we give you together. It is a difficult task. The parallels and next steps are not always clear or apparent. But we are working on it. So now I want your opinions. I am sure the comments section will more than prove that the methods I mention above are not the definitive answer to learning electronics. The ultimate way to learn electronics is still to get a degree, but are other methods still feasible? How did you guys learn electronics? I know most will have through a higher education, but what about the topics they did not cover in school? How did you go about learning them, and how would you teach them to someone else? New Product Friday: What are Your Digits? I support the direction a couple of the earlier comments are going for the next step: a real world project. In general I think someone finishing with the SIK should build something designed to be more permanent and work in the real world that requires soldering, fabrication, sensors and motion. Just as an example, I developed and posted plans for a simple robot of this sort (http://robot50.net/projects/robot-bootstrap/) to use in mentoring makers, which I think I will repackage as a mini-sumo so it has more of a point to it. Sparkfun could do a SIKII which uses a prototype board that require soldering instead of breadboards, gear motors/motor controller instead of a servo, battery power, etc. Actually one robotics project and one IoT project might be a good idea. Build something with permanent connections, put it out there for extended use by others and see what breaks. I would like to see SfEducation involved in creating more competitions. A competition pulls together many of the ideas in the other comments; 1) Many (especially kids) are 'hands on' rather than theoretical learners. 2) Having a goal and deadline is great motivation 3) A community is formed and/or reinforced around the competition. Although robots quickly come to mind, there are other problems ranging from fun and interesting to globally meaningful that would make excellent challenges. I have been involved in FIRST Robotics for over 10 years, it is a fantastic program and has had a wonderful impact but having to fund-raise $20K so a handful of kids can compete puts it out of the realm for individuals and small groups that just want to learn and have fun. 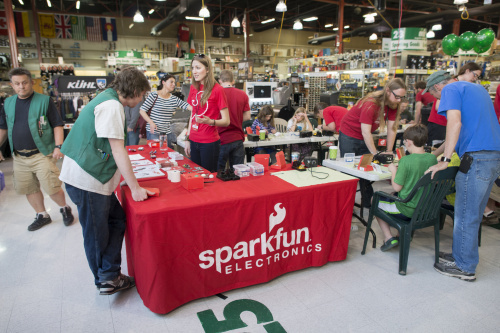 Sparkfun is perfectly poised to run with this idea, You have a growing ecosystem of customers, teachers, makerspaces that would facilitate local competitions. You have an Education department to come up with creative challenges (this is not an easy task). You have the product resources that allow even beginners to participate fully. If one of the rules was that you open source your entry, you have a growing set of tutorial info and possibly new products. Sorry for the long post, you hit one of my hot buttons. I was a music major (sorry Mom & Dad), so am an un-degreed learner. 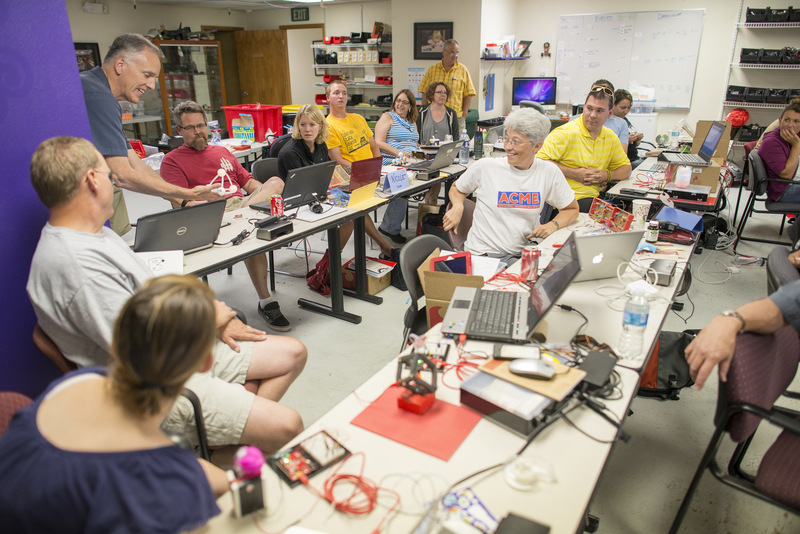 I have been continually learning - books, Coursera, and eventually made it to a Sparkfun SIK workshop. That launched me further and faster than anything else. I work in theatre, so with every new show, I am afforded new opportunities to learn. With each show, I am able to find something that can be done more smoothly, faster, or with greater precision, with electronics. I've become reasonably fluent in programming stepper motors, off-board or stand-alone lights, servos, MIDI, relays, IR, bluetooth, LCD screens, and am currently working on sequencing the illuminated dance floor for Saturday Night Fever independently of the light board. (Running it through the light board could take up to 81 channels.) I am lucky to be in a position where I can create learning opportunities for myself with hard deadlines. More often than not, I have explained a project to a production team, knowing that it is possible, but not yet knowing how to do it. Then I have to learn something completely new in a finite (and usually short) period of time. Passion helps immeasurably. I get excited about every project, not only for the wow factor of the finished product, but also for the new lump of knowledge that I know will wind up in the filing cabinet of my brain. I haven't thought deeply about this, but the "shape" that pops into my head from this discussion is several "base stations" (Redboard SIK, Redbot SIK, Lilypad SIK, an audio SIK, communications SIK, power SIK), with add-ons to take learners beyond the first experiment guide. The audio SIK might be built around a small amplifier and speaker, with tone generators, Atari punk console, and microphone (piezo? speaker-as-mic?) experiments. The add-ons could be a (modular/expandable) keyboard, recording/playback (digital or analog), filters, frequency analysis, mixing signals, etc. Communications could be wired, light (visible and IR), and low-power radio, analog and digital signals, with add-ons for error correction, security, range improvement, data rate improvement. I think that by the time someone worked through a base SIK and three or four add-ons, it would be hard to stop them from plotting their own learning course after that. My first comment is that I just looked at the manual for the SIK. 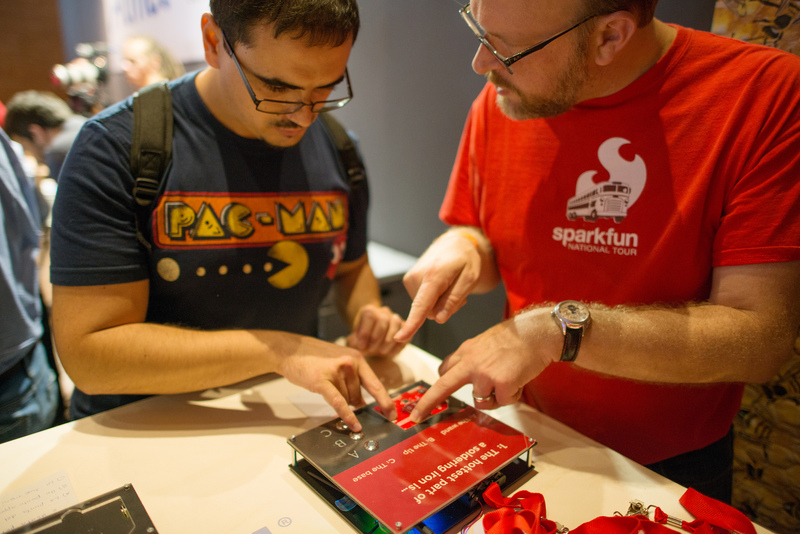 I'd suggest a bit better ending than the existing "Learning More" page -- spell out a bit more than just visiting the SparkFun website, though include mention of it. Next comment is that I've been tinkering with electronics since the mid-to-late 1960s, and one of the primary references I've used is the ARRL Handbook (the ARRL - American Radio Relay League is the national "ham" radio club). It is published every year, but frankly, I'd only buy a new one every three to five years, but keep the old ones, as they sometimes "delete" useful info! The last comment that I have (or at least have time to type in at the moment) is that I have so many encounters with "beginners" that I put together my own website www.ki7tu.com as a "repository" for "wisdom" (and, admittedly, some "wisDUMB") I've accumulated these nearly 50 years. I learn more when something doesn't work and I have to figure out why. So how about another book to go with the existing SIK, but this book has circuits to build that don't work and the user has to troubleshoot the circuit or code to find out why. You could have online hints or initial steps to point people in the right direction if they get stuck; frustration is never fun. A simple example could be the current limiting resistor mentioned.The book specs a 10k, so the LED doesn't light. Solving that problem is an opportunity for a bit of circuit analysis and ohms law. I am just getting back into electronics and programming after a 25 year gap because my 10 year old daughter caught the bug while at an I-bricks robotic camp using the Lego Mindstorm. We dusted off a snap circuits set that she had which helped her enthusiasm take off and leave her wanting more. (Snap circuits are fun and easy for kids, but does not really teach how it works). In researching next steps I learned about the Make: Electronics book and component sets to accompany, then there is Make: More Electronics. These are well written and reasonably priced. Between the SIK and the Make books she will be busy learning a lot that she last a while and I will try to keep up with her. After that would be the Redbot kit and then the Projects Book. I wish that I had all of this when I was 10! Lastly will be to use the forums for new ideas. She learns way to fast for any program we have tried through STEM groups so buying these learning kits and working through them at home is the best thing for her. If anyone has suggestions to add then please let me know. Could be wiki based with moderators somewhat like wikipedia. There are already so much tutorials / learning out there would should allow the community to organise it. Everything I learn becomes more tools I can use, "more tools in the tool box." From the SIK to looking up other projects and code there is always something to glean. Tools allow me to do thing easier, solve problems, or create things never imagined. Once you have learned every song in the song book, the next step would be to make your own song with the tools you have. For the past 6 years, I've been flirting with the idea of writing a "textbook" (more like a handbook) on doing electronics. (I got a chapter written). Going from the basics and then doing a "choose your own" adventure to either MCU or Digital logic.The concept was to provide the base knowledge, build the analytical knowledge, and then test the both with experiments through thought and diagrams to actual hardware. The book, of course, was going to be purely open sourced, and heavily cited valid sources as well. However, as time progressed, I've had less and less energy to dedicate to it, and lower drive. With that said, I think it's time for SFE to do something similar, and start reaching out to customers/users to write tutorials and actually guide where the knowledge needs to go. Sort of like discovering an ancient city based upon sparse evidence. I would recommend to build something that solves an everyday problem of yours. It's a technique that entrepreneurs use to create a product and learn if it has market viability, to solve the same problem that other people might have. Start off with a simple problem and solution and build an Arduino widget. Get more and more complex as you continue to solve problems of your everyday life and potentially expand to bigger issues outside of your world. Soon you will start googling, reading, asking, and researching things in the Arduino world and beyond as you build your solutions. You'll keep learning as you go and you won't even know it because you will be invested into a project that you actually care about. I tend to point people in the project oriented answer. The SIK is good at giving you a brief overview, but rarely do people learn electronics because they are bored and are trying to fill up brain space. It is usually because they have something in mind. That something might be generic like "I'd like to learn to build robots" or more specific like "I want to build a weather station that posts information to my webpage". In both instance I'd say start with a part or parts and start learning how to add them into what you already know. Whether that is motors and motor drivers, weather sensors, or wireless. Start looking and products, their descriptions, and the example Arduino code. Then ask lots of questions (in the comments, in forums, to friends, to our techsupport). Once you have the basics find something you want to do, it will help keep you motivated and give you a sense of accomplishment once you've finished.